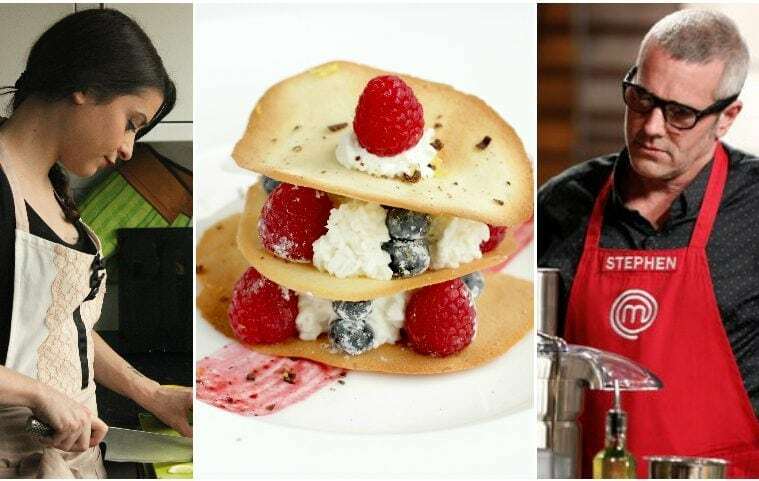 Just a few days ago three of the best home cooks in US have battled until the last second for their chance to be crowned the next american “MasterChef “. He may not have won, but my friend Stephen Lee did an incredible climb, reaching the top 3 and well deserving it. He fell just before the last duel, fighting against a deflated soufflé, one of the most difficult things to nail ( especially in just one hour when you’re simultaneously cooking a steak, fries and an equally tricky pannacotta). I admire Stephen a lot for being so genuine during the show, and I can relate to his rock’n’ roll/slightly wild attitude in the kitchen and in life. And when it comes to food we share the same philosophy. 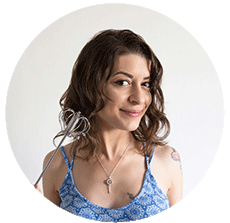 ” I want people to have a real love for cooking whole food and eating good food. Every single person has the right to eat good, nutritious food. Take care of yourself, and your family, and the land. That’s what it’s all about “. 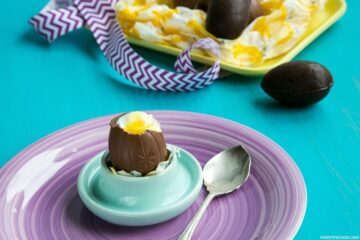 We have teamed up together to create a simple but showstopping dessert ( in perfect Masterchef style) for you all to recreate at home. In this case I was more the executor and Stephen the mastermind behind this michelin-star-worth dessert. I have had the chance to cook with other masterchef contestants in the past and I’ve always felt connected to each one of them. Whether it is for the attitude, their cooking techniques or food choices, there’s always something that bonds me with these amazing amateur cooks and Stephen is no exception. I’ve loved his choice of ingredients and his cooking techniques during the show just as much as in this dessert recipe. It takes literally less than 30 mins to make this Tuiles and Berries dessert and even though it looks absolutely stunning, you won’t believe how easy is to prepare. Superbly aromatic and loaded with vibrant flavors, I’ve especially loved the peppery and lemony notes, they both uplift this dish to another level. Tuiles were one of the things I never baked before, and I always thought they were quite tricky to make. Thanks to Stephen I’ve discovered how easy and delicious they are. Stephen: “While in the kitchen I’ve always tried to follow the five P’s: Proper Planning Prevents Poor Performance. 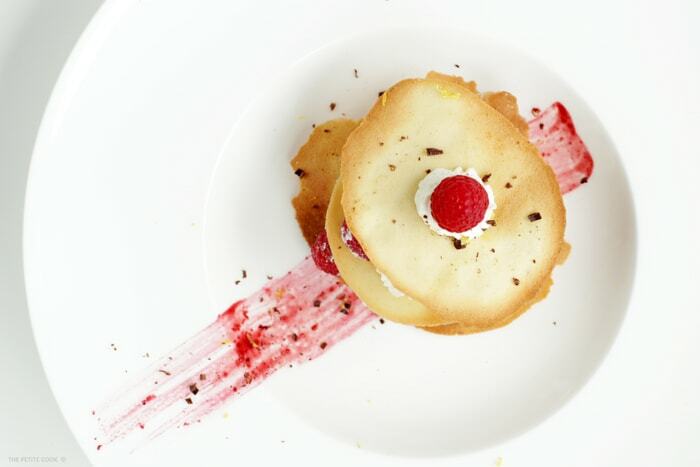 When I created my Tuiles and Berries I wanted to come up with an original, delicious and visually creative dessert recipe that I could execute in an hour from start to finish. There are a few things that I always consider in the development of a recipe: the taste, the visuals and the difficulty. This recipe satisfied each of those factors perfectly for a typical MasterChef challenge. I like to forge through recipes and books to see what other great chefs use. I spend vast amounts of time thinking about food, recipes, ingredients, techniques and pairings; always studying and researching, hoping to find the hidden paradise that is really only discovered by working hard, trying new things and not fearing to fail. 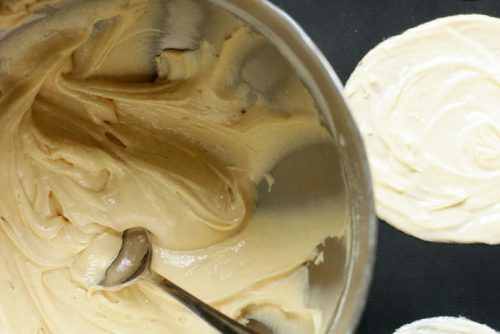 Every aspect of this dessert gets elevated from the first step, down to the last step. That is where the importance of the Buddha’s hand comes into the mix, this is one of the most aromatic of fruits that I have experienced. When I discovered the Buddha’s hand, which at first one can take as kind of ugly, I felt a connection to that odd little curious fruit and I wanted to give it the perfect compliment and food pairing that I could. I have a special affinity for the Buddha’s hand because it’s a bit like me, odd, exciting, ugly and beautiful at the same time. I like the idea of being limited only by our own imagination. I romanticize food and ingredients and feel that they deserve to be romanticized, because when you find things that pair scrumptiously together, it really is divine and it is also a beautiful gift to give to others. Stephen has great plans for the future, including a food truck in partnership with Masterchef judge Chef Gordon Ramsay. 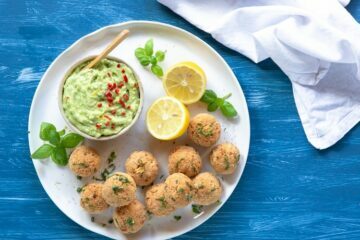 In the meantime you can check out more delicious recipes and follow his culinary journey after the Masterchef kitchen on Stephen’s newly launched website. 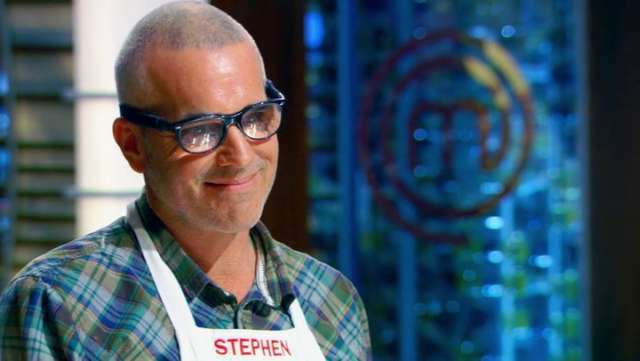 While I’m here, I just wanted to thank Stephen and all the other contestants for making Masterchef even more fun to watch. I’ve never seen such an high level and so much respect in the previous seasons. It may be not much, but you are all Masterchefs to me! 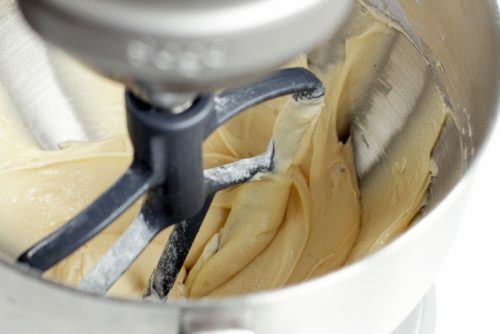 In a mixer with whip or scraper attachment add softened butter and fine sugar. Mix butter and sugar together until pale yellow and forming ribbons by creaming on medium speed for approximately 3 minutes. Add the whole eggs, one at a time to loosen mixture. Add flour, pinch of salt & fresh cracked grains of paradise and vanilla extract. Bake mixture in the oven at 425F/190C for 9 minutes or until the edges are lightly brown. Immediately take one tuile at a time and very gently shape with the help of a rolling pin. If it's too hard to shape, just put the tuile back in the warm oven for a few seconds. 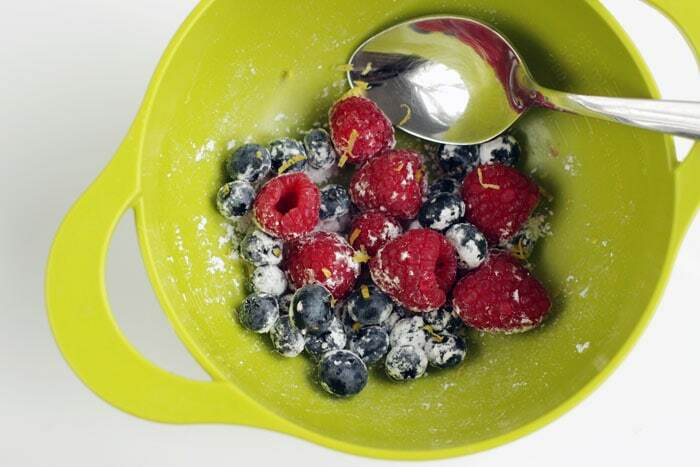 Mix raspberries & blueberries. Add one level soup spoon of confection sugar, a pinch of five spice & and 2 tbsp lemon juice (adjust to taste). 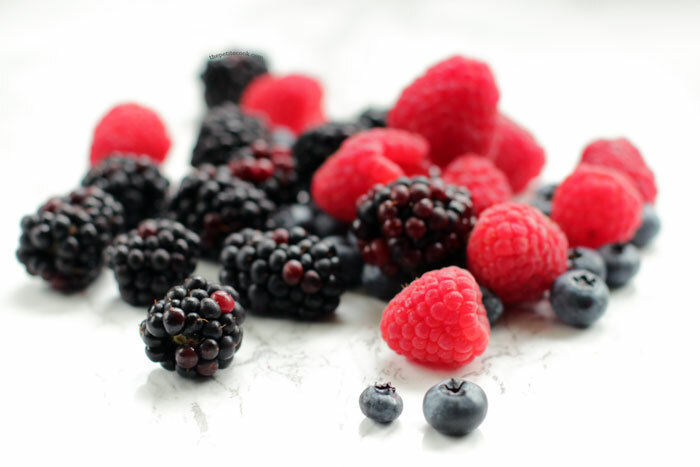 Put blackberries in blender, add 1 tbsp. of lemon juice, Ibarra chocolate & grated Buddha's hand citron. Blend and set aside. aroma. Grate Ibarra chocolate onto plate. 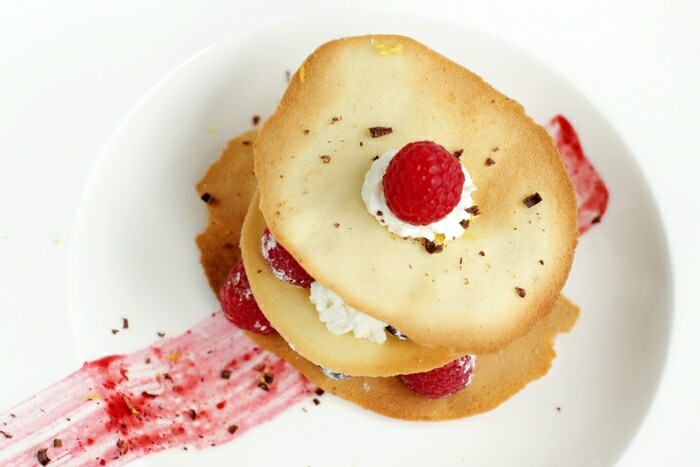 Layer berry mixture, berry puree & tuiles to liking. Spoon mascarpone cheese onto plate. 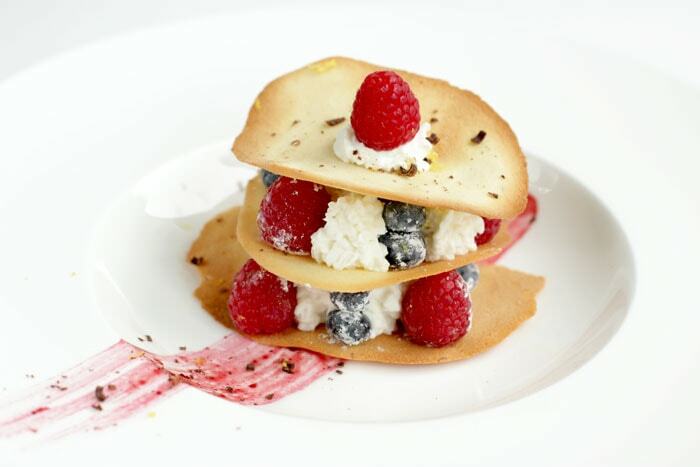 This Tuiles and Berries dessert is simply heaven on a plate. It’s unbelievably easy to put together and it’s so effortlessly elegant. A lovely way to impress your guests at your next dinner party, with little if not stress at all. 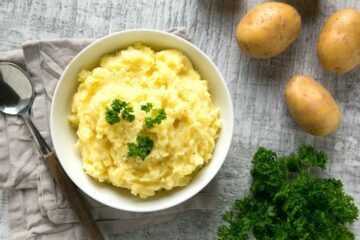 If you try this recipe ( and I’m sure you will! 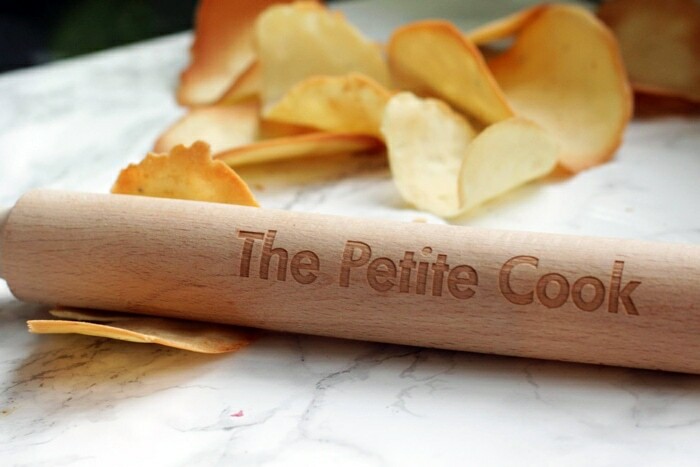 ), don’t forget to comment here below, and snap a picture and tag it #thepetitecook on Instagram, I’d love to see your creations. And while you’re there, check out Stephen‘s account, he makes me hungry all the time!